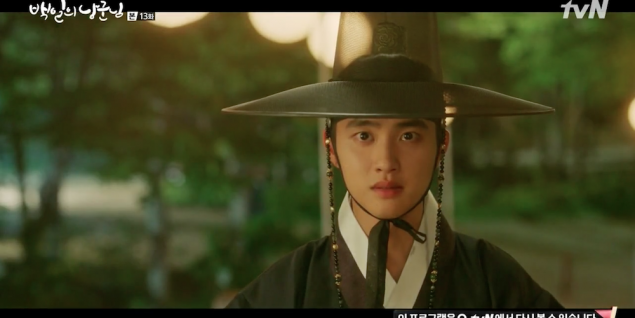 This weeks' episode 13 of tvN's '100 Days My Prince' felt slightly like a filler episode at times. 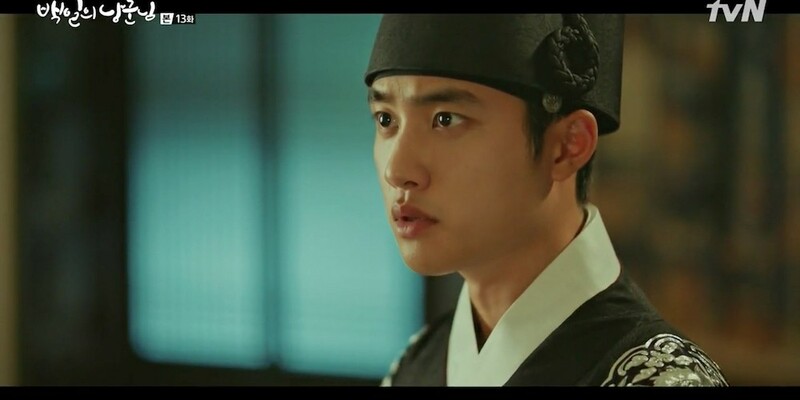 Despite confirming that they still have feelings for each other, the crown prince Lee Yool (played by EXO's D.O.) and his peasant ex-wife Hong Shim (played by Nam Ji Hyun) must try to forget about the other, because their worlds cannot meet. 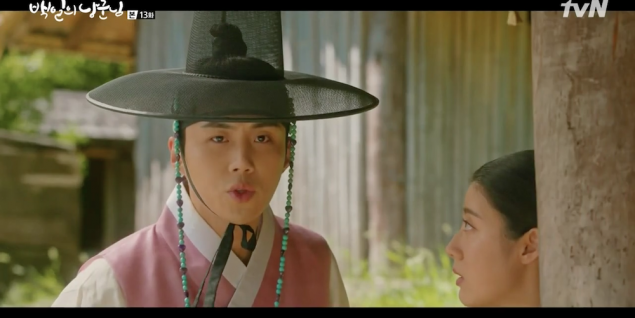 Which also means that in episode 13, our secondary male lead Jung Jae Yoon (played by Kim Sun Ho) got to have some critical moments with our female heroine Hong Shim. You're the second male lead? What have you been doing all this time?? I was just getting warmed up! Everybody knows the real star of the drama makes a big impression in episode 13! Uhh... s'cuse me... I need saving..? To sum of the main events of episode 13, a foreign ambassador pays a visit from an allied country in order to "celebrate" the fact that the crown prince isn't dead. However, this foreign ambassador is a tricky one to please, and Yool must convince the ambassador that even if he returned from the dead, he's still a "worthy" crown prince and the next heir to the throne. In the midst of these trials, the foreign ambassador's son (who turned out to be a daughter) goes missing, and Yool is tasked with finding him/her in secret, as the ambassador does not want to let out the secret that his son is actually a daughter. But the ones who actually step in to solve the missing person case of the day is the unlikely pair of Jae Yoon & Hong Shim. My time to shine, suckers. You get caught in my way, you're all DEAD. Hong Shim and Jae Yoon are able to work together using their wits to rescue the foreign ambassador's daughter, but in the process, Yool finds out that Jae Yoon is in love with Hong Shim. Checking on a woman who is clearly wounded. You DARE crouch down in front of my ex-wife?!?! I'LL END YOU. So then basically, we have a brief, of man to man conversation where Yool asks something along the lines of, "You plan on snatching away my ex-wife??" and Jae Yoon responds something like, "Maybe..?". But filler episodes also have their own purposes too, and at the end of this filler episode, Yool receives valuable advice from the foreign ambassador, who takes a liking to the new, memory-less Yool once again. "Do not trust your father-in-law and his people so wholeheartedly", or similar words. And just a few moments after that, we see the troublesome father-in-law Kim Cha Un meeting up with the foreign ambassador himself. Here, Kim Cha Un warns the ambassador that "a war is coming". This is supposed to be historical romantic comedy drama. What the f*** is that Kim Cha Un doing, trying to start a dang WAR?!?!?! That was very, very alarming to hear Kim Cha Un saying that he may be starting an actual war in this country. Wars are very scary. But since episode 13 gave us no more information on that subject, we'll have to wait until the next episode to find out. 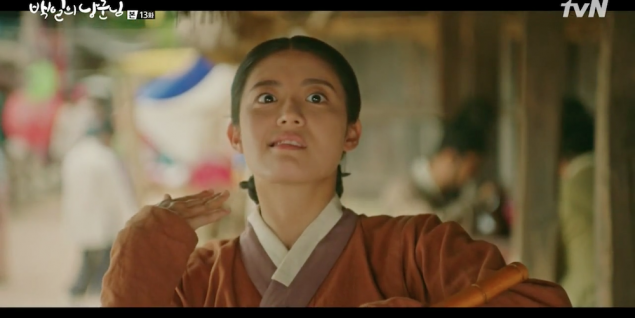 Meanwhile, after dedicating her whole day to finding the missing daughter of the ambassador, knowing that it was to help Yool; Hong Shim realizes that she did, in fact, come to the capital city of Hanyang partially in order to be closer to her ex-husband. She admits to her father that she can't just forget about him like he never existed. She also admits that she still loves him a lot, and she's not going to try to force those feelings away. For me, this was a very heroic confession coming from Hong Shim. 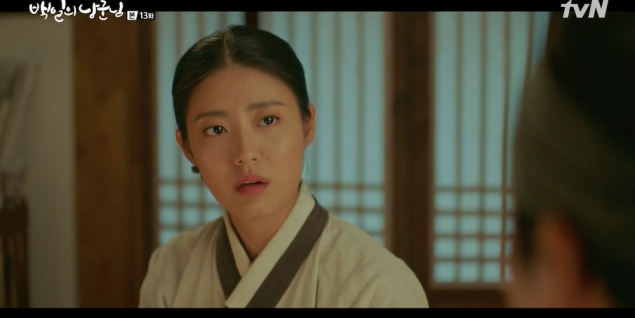 It's one of the first times in this series that we've seen her open up in such a sincere and exposed way to someone other than Won Deuk/Lee Yool, and therefore a very key, female heroine moment for her. Preach it, Hong Shim, preach it!!! Then, finally at the end of the episode, Yool and Hong Shim reunite on the scenic bridge, where Yool reveals that he is the young boy from Hong Shim's childhood. It's me, that dumb little boy! Again, not a ton of development in this episode, but definitely some big hints here and there as to the major obstacles to come very soon. Without making too many assumptions and speculations about what will happen next in our series, I'll leave the score for episode 13 more or less the same as last week's score. Here's to hoping that Kim Cha Un DOESN'T start a war and accidentally kill EVERYONE. Queen says: Do I even get to come out in this drama much anymore? Whatever, I'll just watch the bloodbath from my paper window. 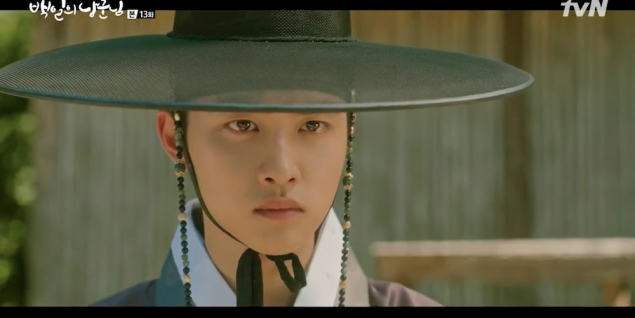 next week will be the last and i will miss d.o as the crown prince..